It takes you no longer than 20 minutes to set up the import to AccessAble Help Desk Pro and run the test data transfer. We do not share any of your information with third parties, and additionally meticulously protect it, so not a thing gets lost or stolen. 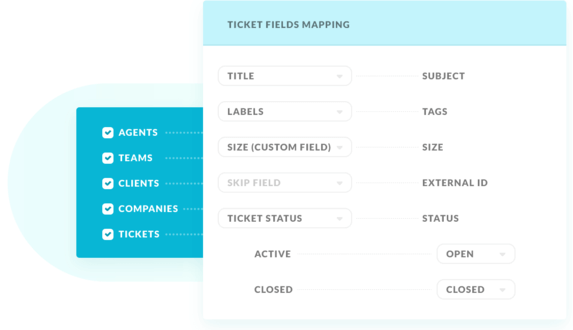 All tickets will be imported to AccessAble Help Desk Pro with their corresponding agents, contacts, and attachments, as a result, saving the record of customers' requests. Grant the right to access your AccessAble Help Desk Pro account. We consider security very seriously and have established a complete set of practices , technologies , and policies to help ensure that your data is protected.